I was going to post this under the "Sick Political News", but this deserves its own discussion. Naturally, Palin's camp is scrambling for some possible defense they would like to hurl back at the Democrats to see if they can create a distraction from the fact that this woman was on her political "hit list." Do I think Sarah Palin wanted Giffords to die? No, I don't. I think she was trying to play up her gun toting, Alaska maverick, pro-revolution shtick. The people who actually listen to the right though, do not understand nuance, and this psychotic saw Giffords as an enemy of the people. Did she want her to die? No, but she is ethically responsible. There are a few other "differences" between what Palin did and the DNC's chart. The Democrats identified ENTIRE STATES that Bush won back in 2004 by a slim margin of percentage. 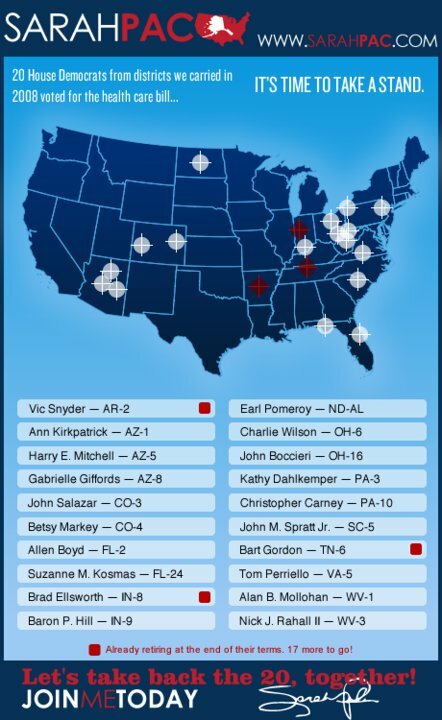 Their bulls eyes indicate places where they want to campaign heavily for Obama in 2008. Palin identifies specific districts and a specific CAUSE with "districts we carried that voted for the healthcare bill." Most importantly, Sarah Palin identifies names. She puts out a list of names using rhetoric like "Time to Take a Stand", and gun sights. This the lamest attempt at false equivalency that I have seen yet. FOLLOW UP: I left a comment on above linked blog, but was told it would appear after approval. Since there are 0 comments so far on the article, I imagine that the response to his "defense" would be overwhelmingly negative and ridiculing. Damn, maybe I was wrong, and this crazy incident can wake up some of the right people up after all. I've said that hate doesn't sell as well to the ("bleeding heart") left, and that's why Air America died. Just crossing my fingers now. meh, crossing fingers won't get anything accomplished. Historically speaking, right-wing rhetoric has set the paradigms and I expect this will be no different. Ulimately, the right wing will convince the rest of society that they are not to blame and all the democrats that have ever been assassinated in history were simply coincidences enacted by mentally challenged sub humans. And everything goes back to normal. Why did you have to post this, it conjured up negative emotions. AAAAHHHHH!!!!! I read this post a few minutes ago and I thought "who the hell is Erick Erickson"? I turn on the radio to WSB and low and behold who is the guest tonight on the talk show. Erick Erickson! My hair just stood up on the back of my neck. And they are going to be talking about the Arizona shooting starting now. I bet I will be posting again soon to tell you what he says. Nope, I won't be posting about what Erick Erickson said on the radio tonight. He keeps jumping from subject to subject without any connection between them. It is odd and too boring. I can't take it anymore. Off goes the radio. Excellent article by Hitchens about using violence and assassination without just cause in Slate. Makes me thankful that even though this was a tragedy, at least we have laws, and can't claim divine right to pop whoever we want. FOLLLOW UP: No response or publishing of comments. At this point, I will not check back. It's been a couple of days and there are still 0 comments on his blog. He has refused to publish any, either in affirmation or dissent, so I can only assume that he has been overwhelmed with dissent.